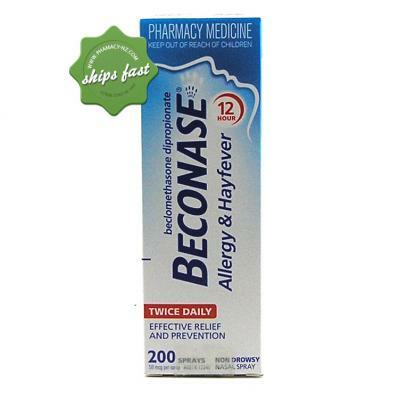 Beconase Allergy and Hayfever Nasal Spray 50mcg comes in a 200 dose bottle. A corticosteroid treatment for seasonal allergic rhinitis including hayfever, and vasomotor rhinitis. Naphcon A Eye Drops are an allergy relief eye drop which works fast and relieves red, itchy and runny eyes caused by hay fever and allergies. Are hayfever, allergies, and rhinitis causing you discomfort? These seasonal issues can cause swelling and inflammation in the nose making it harder to breath. 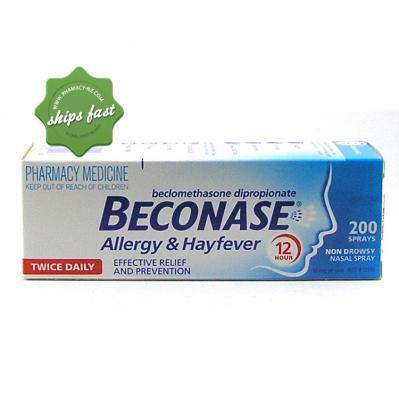 Beconase Allergy and Hayfever Nasal Spray 50mcg comes in a 200 dose bottle and is used as a short term treatment for seasonal allergic rhinitis including hayfever, and vasomotor rhinitis. It offers immediate relief for symptoms including: sneezing, blocked nose, itchy nose, runny nose and eyes. Works directly at the affected area. Beclomethasone Dipropionate BP 50mcg per spray. Adults & Children Over 12 - Never take more than 400mcg a day. Administer two sprays in each nostril twice a day. Once you have control over your allergies you may want to lower dosage to once a day treatment. If symptoms re-occur then return to twice daily treatment. For the best results it is important to use this product regularly to avoid hayfever attacks. *It is not yet known if this product is suitable to be used by children. 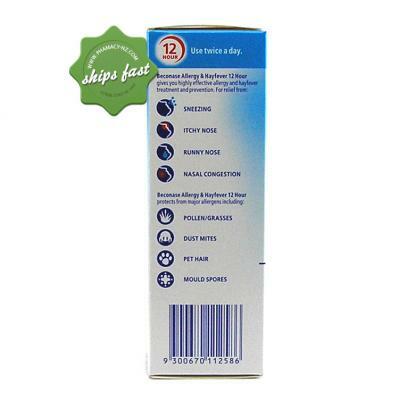 It can take 2-3 days to build up the dosage for maximum protection from hayfever and allergies. You get 200 uses out of a bottle and you should discard the bottle after 3 months. Some people experience sneezing attacks after spraying the Beconase up their nostril or experience headaches. If you experience persistent side effects consult your pharmacist. Are there any precautions for this product? You are pregnant, lactating or planning to be pregnant. Have had previous allergic reaction to Beconase or its ingredients. Do not use if you are under the age of 12 - without the advice of a doctor. Develop symptoms of infection including facial pain, swelling, bleeding, fever or discharge. If symptoms do not improve within 7 days. So happy to be able to purchase from this pharmacy. Ordered from the United States and received the prescriptions really fast. I'll definitely keep using them.